Lucky 8 Roulette has been with us in one form or another for nearly ten years, and although it has been relegated to the back menus of the bookies FOBT machines, it still gets played by a few dedicated fans. Using 50 numbers from zero up to 49, Lucky 8 Roulette provides greater odds with the added bonus of a randomly occurring progressive pot. You can play Lucky 8 Roulette at William Hill and Betfred bookies, as well as online at William Hill Casino, which although is similar, it does use a slightly different format. The concept of Lucky 8 Roulette is as straight forward as playing regular roulette, with bets available both straight-up on any number, as well as outside bets on red / black, high / low and odd / even. There is also a hot and cold number display which shows which the most hit and least hit numbers over the last 500 spins. Use this as only guidance, the hot and cold chart has no baring over what is ‘due’ as the game is random. Most people play these for the progressive pot which starts as low as £0, up to a maximum of £350. The pot increases in increments of money depending upon how much is bet per spin. Like all FOBT roulette games, the maximum prize per spin is £500, with a maximum stake of £100. The progressive pot is triggered when the ball lands in the Lucky 8 position on the roulette wheel. This will then trigger the bonus round which gives a true odds games of 1/8 of hitting the pot. Landing on the Lucky 8 position will pay the entire value of the pot as well as any money that was placed on the Lucky 8 position on the roulette wheel. Many Lucky 8 pots are on very low values, and there is a very good reason for this, the same reason in which why the base pot can start on £0. This is because you do not need to bet on the Lucky 8 position to win the pot. Any time the ball lands in the bonus slot, the bonus will be triggered regardless of whether you have bet on that position. If it then proceeds to spin onto the number 8, the pot will be paid. This is not a cheat or a special way of playing them, they have been designed like this to allow regular players to win the pots without them been targeted solely by professionals. This also explains why the pots are incredibly low values in the majority of cases, as they pay out far more often than people give them credit for. 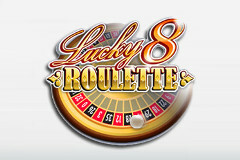 Lucky 8 Roulette is an enjoyable roulette game, which can be found on the back pages of the latest roulette terminals, or played online.